I completely loved this tutorial. Its so simple and yet the dress is uber beautiful. Check it out. It will go nicely with this bracelet. 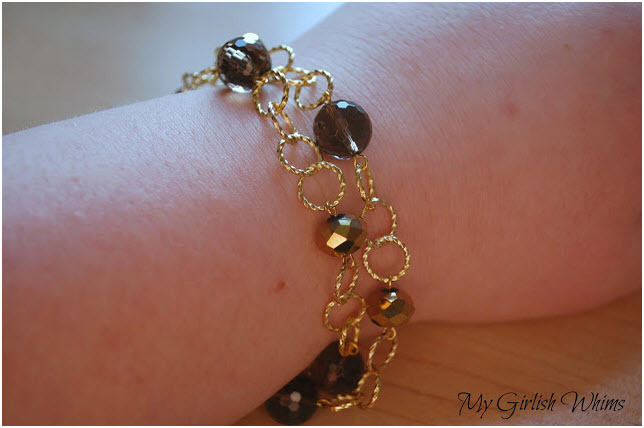 Click here to view the tutorial for the bracelet. I normally get most of my supplies from my local market (like seed beads, glass beads, rhinestone strands, etc). I am yet to find a local online store that I can order from. For specific pieces like fancy brooches I will like to add to my necklace, I often order those from Amazon and have it delivered to me. TO make sure its not a complete waste of money, I make sure I order enough so that I can sell some and recover my money back. For fabric, I still go to my local market to buy them or travel all the way to Aba (its a state with the best fabrics in my country) to get fancy, unique ones. Hope this helps. Previous Previous post: Are you stuck? Next Next post: Let’s make a brooch! And then another necklace.